Some authors of the paper in Nature Photonics (reference ). From left to right: Yuan-Zhi Liu, Fredrick A. South, and Stephen A. Boppart. Beckman Institute for Advanced Science and Technology, University of Illinois at Urbana-Champaign, Urbana, Illinois, USA. Eye imaging is very important not only because the vision is the primary human sense but also because the eye is the direct viewing window of the central nervous system. 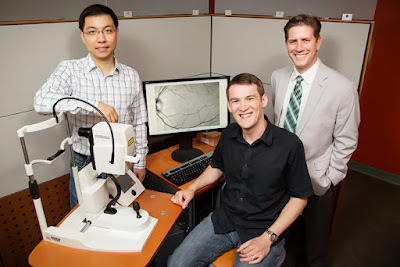 Acquiring the detailed information of the individual cells, blood vessels, and nerves at the retina of the living human eye could enable earlier diagnosis and better treatment for degenerative eye and neurological diseases. Optical coherence tomography, OCT, is a medical imaging technique analogous to ultrasound imaging, but has a higher resolution because it uses light rather than sound. Based on low coherence interferometry, OCT decouples the transverse and axial resolution, and can reject the out-of-focus background to achieve the depth-resolved image. Since the first application in eye imaging, OCT has become the standard of eye care for diagnosing and tracking disease, such as glaucoma and age-related macular degeneration . The presence of ocular aberrations in the eye, however, limits cellular resolution tomography of the human retina. Combined with OCT, hardware-based adaptive optics (HAO) has pushed the limits of eye imaging, enabling diffraction-limited imaging of previously unresolvable structures, such as the three-dimensional visualization of photoreceptor distributions and individual nerve fiber bundles in the living human retina . However, the sophisticated hardware and controlling software of HAO adds considerable complexity and cost to the standard OCT system, limiting the number of researchers and medical professionals who could benefit from the technology. In our recent publication , we developed a phase stabilization technique and fully-automated computational adaptive optics (CAO) approach in conjunction with a standard en face optical coherence tomography (OCT) setup to computationally correct strong optical aberrations even in a highly-dynamic sample such as the human eye. This is the first time clear images of individual human photoreceptors, both near and far from the fovea, have been obtained in the living retina without the need of HAO. Figure 1: (click on the image to view with higher resolution). Cone photoreceptors in the foveal region of the retina. (a) SLO image with the location of the photoreceptor mosaic outlined. (b) En face OCT mosaic before aberration correction. (c) The same OCT mosaic after automated correction. The insets are zoomed by 2X. In HAO, a wavefront modulation device, e.g. deformable mirror, is used to physically modulate the pupil function to correct wavefront aberrations. CAO is a post-processing technique based on the complex signal from the interferometric measurement of OCT. The digital aberration correction filter is applied to the computational pupil plane, which is calculated from the Fourier transform of the focal plane image. The frequent and unavoidable motion of eye can severely interrupt the post-processing of the interference signal. In combination with the high-speed image acquisition from an en face OCT setup, the phase stabilization algorithm corrects even the sub-wavelength motion by comparing the phase differences of the adjacent frames. Afterward, a computational technique simulating the operation of the hardware Shack-Hartmann wavefront sensor is used to correct large optical aberrations which revealed individual photoreceptor cells. A technique named guide-star-based CAO is then applied to utilize the individual photoreceptors to sense and correct smaller, but still significant, aberrations. CAO opens a new way for high-resolution imaging in ophthalmology. In addition to lower cost and simpler system configuration than HAO, the post-processing nature of CAO also allows more flexible aberration correction. Consider spatially-variant aberrations as an example. HAO needs to sense the aberrations in each small volume and then execute each correction while imaging the subject. By using CAO, researcher/doctors can shorten the image acquisition time and apply multiple aberration corrections afterward. Released from the physical limitations of the deformable mirror, e.g. the number and the stroke range of actuator, CAO has the potential to correct higher order and larger amplitude aberrations. Because CAO manipulates the complex interference signal, in principle better image quality can be achieved by applying not only the phase but also the amplitude corrections. D. Huang, E. A. Swanson, C. P. Lin, J. S. Schuman, W. G. Stinson, W. Chang, M. R. Hee, T. Flotte, K. Gregory, C. A. Puliafito, and J. G. Fujimoto, "Optical coherence tomography", Science, 254 (5035), 1178–1181 (1991). Abstract. Yan Zhang, Barry Cense, Jungtae Rha, Ravi S. Jonnal, Weihua Gao, Robert J. Zawadzki, John S. Werner, Steve Jones, Scot Olivier, Donald T. Miller, "High-speed volumetric imaging of cone photoreceptors with adaptive optics spectral-domain optical coherence tomography", Optics Express, 14, 4380-4394 (2006). Abstract. Nathan D. Shemonski, Fredrick A. South, Yuan-Zhi Liu, Steven G. Adie, P. Scott Carney, Stephen A. Boppart, "Computational high-resolution optical imaging of the living human retina", Nature Photonics, 9, 440-443 (2015). Abstract.